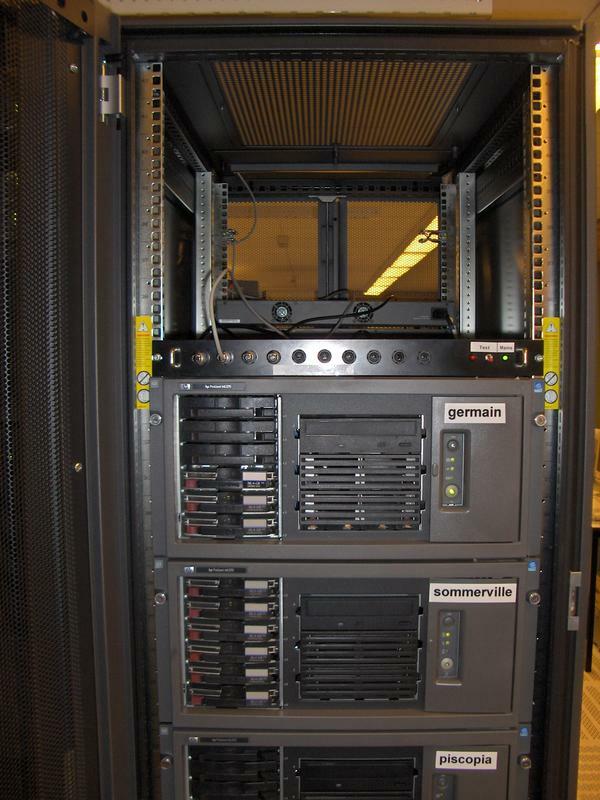 When the central computer/network equipment hall of Tilburg University got new climate control equipment, the Unix system managers were anxious to get relevant information (mostly temperature readings) fed directly into their Nagios monitoring system. Several solutions were available, but none of them really looked good. So I set out to create a simple, low-tech, cheap, but reliable and professional solution to solve their request. Today I completed another copy of the sensor array, in a different enclosure but with the same circuit. With a flat Ubuntu Jaunty (9.04) installation, providing DigiTemp v3.5.0, exactly the same instructions as for Debian Sarge are in effect. It still works like a charm. I then made a tiny change: the VDD pin of the DS1820 now is not clipped off, but connected to GND. 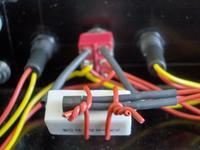 This may suppress a bit of noise that could influence reliability on long wires. Both variants work. 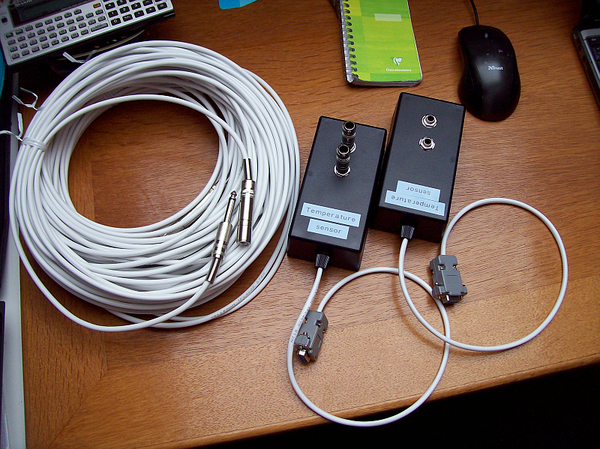 ↑ Two sensor units containing the circuit, this time with just two connectors plus plus one internal sensor. Four 10m extension cords allow for a wide range (much more is possible). 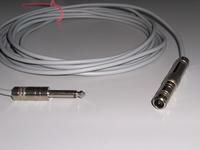 As with the larger unit below, the actual DS1820 sensors are mounted inside metal 6.3mm jack plugs. I got inspired by an article by Stefan Blechschmidt, in which he describes a basic circuit and software to wire up a Dallas Semiconductor (now merged with Maxim) temperature sensor. The sensor is called DS18S20 and can be purchased at well-assorted electronics shops for about € 4.50. DS1820 sensors work exactly the same, but you likely get a DS18S20 anyway. 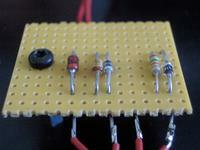 I did not modify the circuit at all (hard to do with so few parts!) 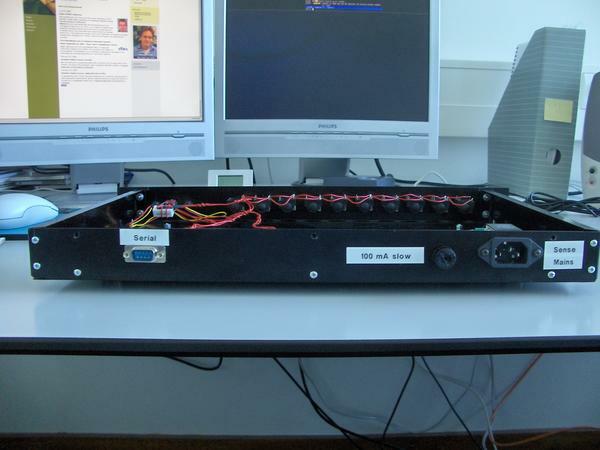 but focused on the embedding of the circuit in the equipment room and the software environment. Update, 2010-07-30 Another variant of the sensor, called DS18B20, has been confirmed to work with this circuit as intended. Thanks to Greg Smith for the information. I needed several sensors. 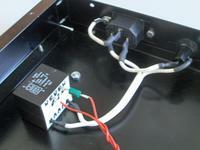 The DS18S20 was perfect for this, as this device is designed for the 1-Wire® bus system. Actually this means that you need two wires, but these two wires carry both power and data. All devices you want are simply put in parallel on the two wires, which may run for several hundred meters. The factory burns a 64-bit unique identifier in each sensor device, which enables the host machine to both list all devices on the bus and address each device individually. The host machine needs a small circuit to convert the 1-Wire bus to something that can be connected to a standard RS232 connector, although the protocol is not at all RS232. Basically this circuit converts the RS232 signal levels to 5V and makes sure that the devices can get power in between data transfer bursts. 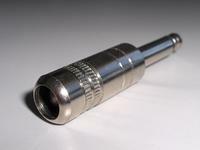 With only five simple components, the cost does not exceed € 2 and the whole circuit can be crammed into a standard 9-pin D connector shell, as this article shows. However, I needed a different packaging solution. The sensors would be spread over the room, so a hub-and-spoke design with the sensors was more convenient than a true bus, snaking from sensor to sensor. Of course, electrically all sensors still are simply parallel on the same bus. The hub then would be an enclosure that could be integrated with the rest of the equipment in the room. For the sensors themselves, I needed some rugged, practical housing that could survive harsh treatment yet was easy and cheap to build. I opted for a straightforward 6.3mm mono jack (phone) plug. The TO92-packaged sensor can be soldered on the two leads of the plug, the third lead of the sensor (VDD, not used in this application) can be cut off (some people recommend to connect it directly to pin 1, GND). With the metal shell of the jack plug in place, the result is a sturdy package that you can throw or drive a car over, yet the sensor is still exposed to the environment. Apply an ID sticker to the shell (remember that each sensor has a unique ID, so you must be able to know which is which) and you're done. With two-wire cable and another 6.3mm plug plus a socket you can make an extension cord of up to 300 meters. I made a handful of these sensors. 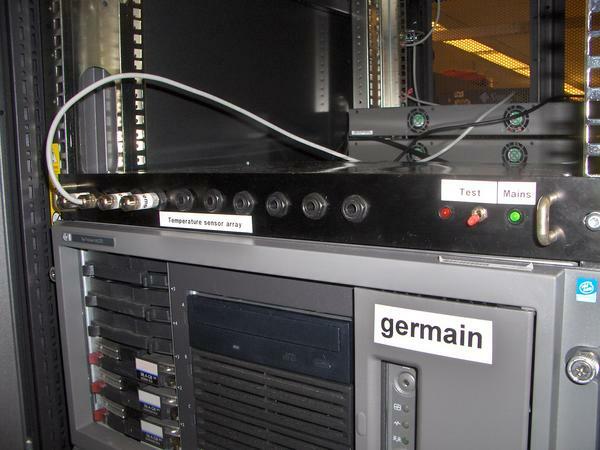 With nearly all computer equipment in 19" racks, the temperature sensor array should also be housed in a rack-mounted enclosure. 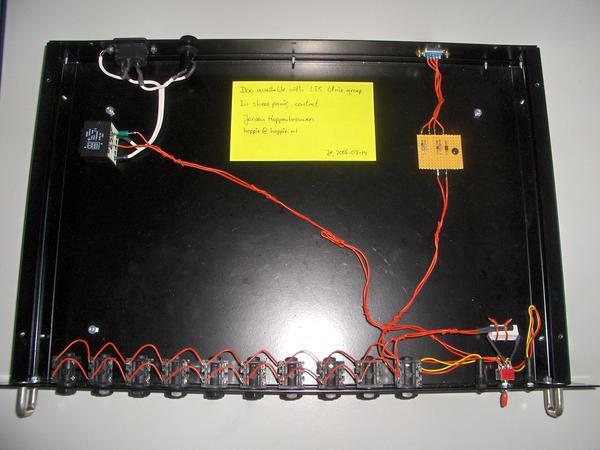 This clearly was going to look silly, putting a stamp-size circuit in a large case, but practicality won. With so much space available, I made a spacious layout of the various submodules of the whole hub. At the top-left, you see a simple power supply with a standard mains socket (grounded, ground wired to the enclosure), 100mA fuse, a 12V/200mA transformer, and a diode. It produces a tiny bit of power that is not used by the temperature circuit but serves a completely different purpose -- read on. At the top right, you see the 1-Wire-to-RS232 conversion circuit, built on a snippet of laminated paper breadboard. Four wires run to the 9-pin male D connector that will accept the serial line from the host computer. I also made a straight-through cable with two 9-pin female D connectors that comes with the unit and connects it to the host computer. Description DB-25 DB-9 Sensor CAUTION! Many people including myself at one point in time printed out this page and glanced at this table when building the plug connections. It is too easy to mix up the DB-25 and DB-9 columns this way, and as you can see, RXD and TXD are exactly opposite. Just cross out the wrong column. And, be careful to which GND you connect the DB shells. Your target is to avoid earth ground (shielding ground) to more than one place. If your computer connection cable has shielding which is already grounded at the computer's side, do not connect it to earth ground at the array side as well. Two wires go to the sensor connector panel. At the bottom left, you see ten 6.3mm sockets that accept the sensors, either directly (useful for testing) or via an extension cord. All these sockets are in parallel, so they are unnumbered. And you may toy around whatever you want as long as all sensors remain parallel on the two wires. At the bottom right, you see two 12V LEDs, a switch, a 82Ω/5W resistor, and another DS18S20 temperature sensor. The purpose of this assembly is to provide for a no-brains el cheapo warning that the power of the hub has been cut. In my particular application, the equipment room has a large no-break power supply and a diesel generator for emergency power. However, there was no means to feed the status of this system into Nagios yet. In the equipment room, there are a few power outlets that are not on the no-break unit; we call them sense outlets. One of these sense outlets feeds the transformer of the hub. I use a normal DS18S20 temperature sensor to sense the presence of power, as it heats up the resistor to about 50° Centigrade. 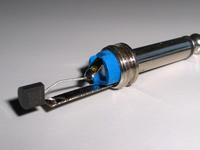 If the power is cut, the temperature of the resistor drops at about 5°C per minute. This is quick enough to let Nagios know the status of the non-no-break power (after all, if somebody is present at the site, there will be plenty of other indications that something is wrong). The (DPDT, six-lead) switch lets the operator select whether the sense power is fed to the resistor (normal position) or to a red 12V LED (test position). The other LED is green and simply indicates the presence of sense power. As a bonus, there always is a temperature sensor on the bus this way, which is handy for testing no matter what temperature it is at. 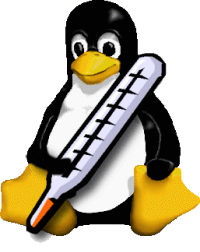 a Nagios plugin that reads the state file for temperature info. However, you may also use the full executable name in the scripts that follow. Your choice. I normally first let digitemp poll the bus for all available devices and write their ROM addresses to a config file. Dependent on where you want the file, you may need to run as root. If later on you discover that a sensor once in a while suddenly produces the figure of 85.0 °C (exactly), increase the READ_TIME value. 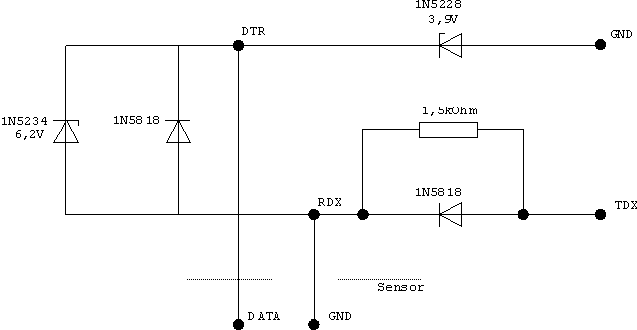 This problem is caused by not allowing the sensor enough time to complete its conversion and transmit cycle. # temperatures in a state file. Called by cron every 5 minutes. # Abort after first script error. # Get a unique temporary tamper-proof file name. # 'Atomically' move the freshly created state file in place. # Poll the temperature sensor array every five minutes. # Append the last poll to the history file after each whole hour. In this example the script is run as root, but you certainly do not need to do this, you may run the script as any user that has access to the TTY port. The second cron command above simply concatenates the state file (current temperatures) to a history file that you might want to keep to create statistics. Totally optional. The actual Nagios plugin checks only the temperature state file, usually every five minutes. I changed an existing plugin to work with temperature bands instead of just maxima, as I want to monitor whether temperatures get out of hand, either up or down. I don't show the whole script inline, but you can download it here. It contains documentation on how to install the script in Nagios, but this is fully standard. See source for License and Nagios config example. 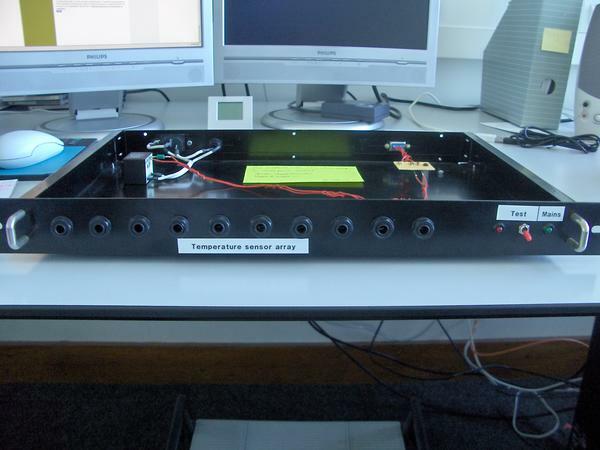 The result of all this is a simple but robust solution to feed Nagios with temperature measurements, which is an essential part of environmental monitoring in many professional ICT operations.